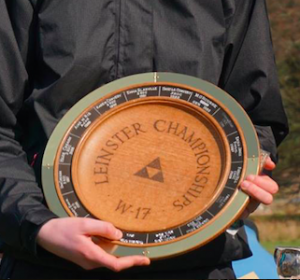 The Leinster W16 perpetual trophy, presented back in the 1980’s by 3ROC, was won by Cliodhna Donaghy (GEN). The class was originally called “W17”. Well done to all our Leinster Champions and runners-up at Stranahely last Sunday! 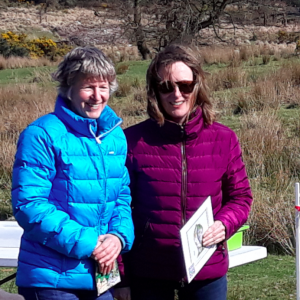 CNOC put on a great event on a big, new, forest area, with sunshine, food and great views of west Wicklow. 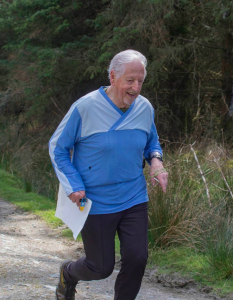 The forest probably hasn’t been used for orienteering since the mid 1980’s so it provided a good challenge for everyone, whether they had run there before or not. 3ROC Leinster Champions are: M16 Cuan Riordan, M18 Aidan McCullough, M35 John McGrath, M65 John McCullough, M70 Brendan McGrath, M80 Frank Martindale, M85 Con Carroll; W55 Mary O’Connell, W75 Trina Cleary, W80 Vera Murtagh. 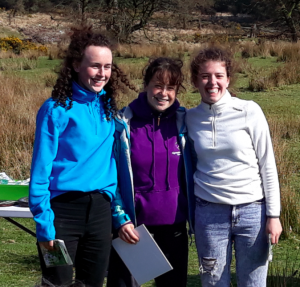 Congrats also to Clodagh Moran (3rd W20), Pat Flanagan (3rd M70), Ana Mandic (2nd W40), Inga Lisauskiene (3rd W40) and Áine Uí Shúilleabháin (3rd W65). The two Elite classes were won by Darren Burke (CorkO) and Róisín Long (UCDO/Ajax). Colm Hill (CNOC) is the Leinster Men’s Champion. 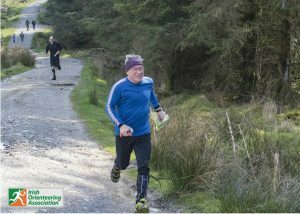 It was good to see some familiar faces returning to orienteering, or just visiting the event: Jim Butler, Mick Nowlan and Mark Donovan. See the full results and the courses and runners’ routes HERE. 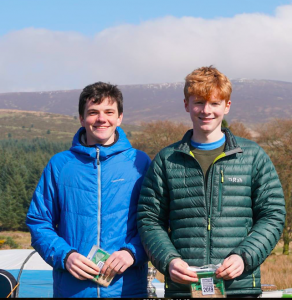 Well done also to 3ROC’s Cuan Riordan – St Gerard’s – (1st in 2nd/3rd year Boys) and to Aidan McCullough – Belvedere College – (1st) and Ben McDowell – St. Michael’s College – (2nd) in the 5th/6th Year Boys’ class at the Leinster Schools Championships at Trooperstown on 10th April. See the full results here. 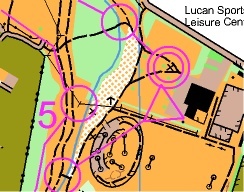 Next Event: Our Leinster League at the Pine Forest on Sunday 14th April. 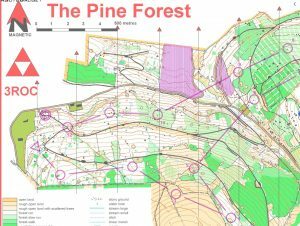 This will be a middle-distance event with shorter courses than usual, confined to Cruagh Wood, the main part of the Pine Forest map. 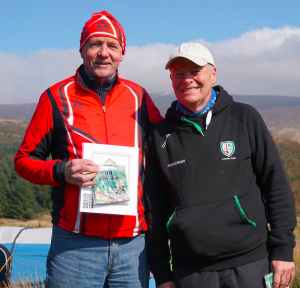 Colm Moran, just back from a weekend’s orienteering in Norway, has planned the courses and updated the map, so it’s an event to look forward to! See the location map HERE. Start times 11 am to 1 pm, as usual. 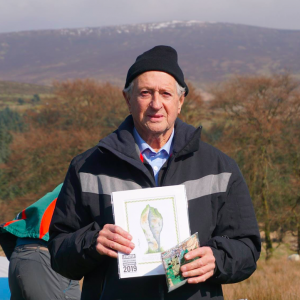 Planner, Colm Moran, says that the longer courses in this weekend’s Leinster League have been planned as a Middle Distance in order to focus on the best orienteering areas of the map, and hopefully encourage more middle distance courses in the future. While this means that many competitors may be capable of finishing a harder class than they usually might, we hope that you will choose to compete in your usual class and instead practice your finer navigation skills, possibly at a higher intensity – perfect prep for the JK or IOC! Due to the nature of the less technical courses, these have been planned as normal. With that in mind, the course details are as follows (with a note of rough class these middles should equate to). Note: There is a 15-20 minute uphill walk to the start. 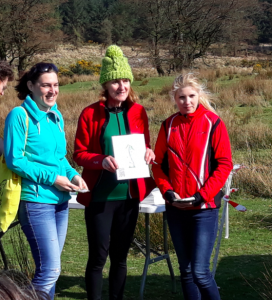 Beginners’ Orienteering: We’ll have a session at the Pine Forest event, specially for beginners, at 11 am, so come along early and get some free instruction on orienteering before you go out on your course, and come and talk to us afterwards to see how you got on! 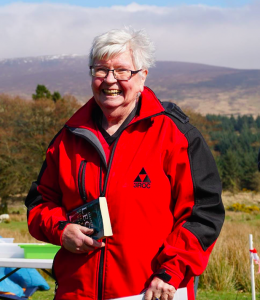 The 2019 3ROC Annual General Meeting last Friday saw a good crowd at the Dropping Well, where the 2018 Committee was re-elected: Emma McAuley (Hon. Treasurer), Ger Butler, John McCullough (Hon. Manager), Kevin O’Kelly, Lindie Naughton, Nadya Dunne (Child Protection). Delicious finger-food followed the meeting and the annual cheques presented to our international athletes were announced: Colm Moran (WOC, SHI), Clodagh Moran (JHI, SHI, JWOC), Aidan McCullough (JHI, EYOC), Clíona McCullough (SHI), John McCullough (VHI), Cuan Riordan (JHI), and Mary O’Connell (VHI). Irish Championships Ready for the Irish Championships? Want to run on a 3ROC Relay team? This is your last chance! Contact 3rockoc@gmail.com by Sunday April 14th. 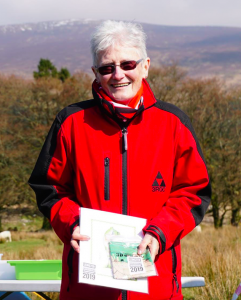 • Learn to carry out risk assessments for orienteering activities and how to use simple course planning tools. • Develop the communication, questioning and feedback skills appropriate for the teaching of orienteering. 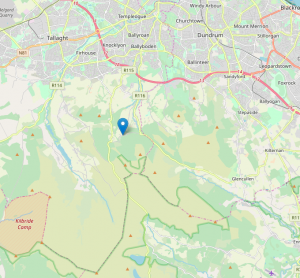 There are spaces available on the course, which will be led by Terry Lawless with assistance from Eoin Browne and Eileen Young, at Larch Hill, Rockbrook, Co. Dublin. 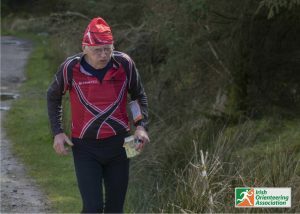 We have three experienced club orienteers already signed up. More details HERE. See you in the Pine Forest on Sunday! Pat Flanagan on the run-in. M85 Winner, Con Carroll, for once not in fancy dress! 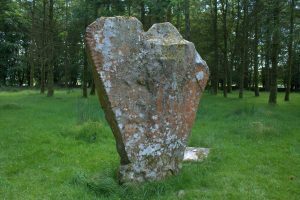 The Knickeen ogham stone, featured in the LOC prizes: it’s on the edge of the competition area.